When you fire up one of these programs, the first thing you will probably do is try to find and add parts to the “build area”. Yeah, pretty much a no-brainer, right? 🙂 There were two main ways parts were presented: list all parts by name or list all parts by picture. Each of these organized the parts into different categories to help make searching easier. Some combined both methods. My personal favorite of the two was listing the parts by picture. It was much faster and easier to pick out a part visually rather than having to read each individual description to make sure it was the correct part. 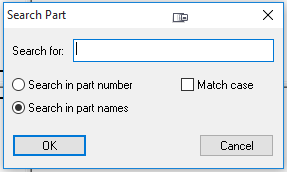 For clarification, the programs that listed parts by name would show a picture of the part once you selected it (before you dragged it out to the build area), so it’s not like it was just a list and you had to “guess” what the part looked like before you drug it out. Let the battle for best part management commence! 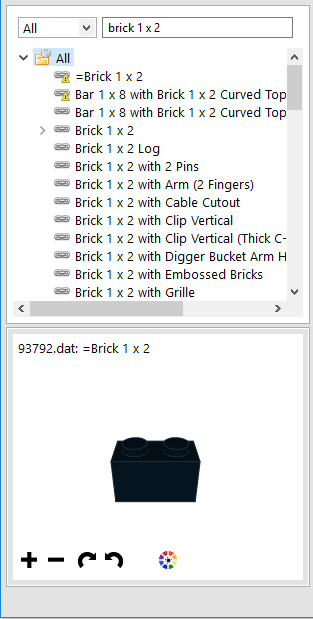 JBrickBuilder doesn’t have what I would call a “traditional” part tree window in that you actually have to click a button, which brings up a search window, before you can start searching for parts. Searching for parts is relatively easy and allows you to search by part name, part description or part number. Filtering is automatic as you start typing, which is a nice feature. You can also select different categories to browse for parts. I didn’t really like that you had the extra step of clicking the “Add brick” button every time you wanted to add a part. Once you select a part it is easy to add anywhere on the build area. You simply move the mouse to where you want it, adjust orientation with the arrow keys (90 degree increments), and then left-click to add it. The part remains where you put it and you can easily add as many of that part as you want. When you are done with that part you press ESC to exit part add mode. There is a button to select from recently used parts, but I didn’t see any way to “Favorite” parts. Summary: Finding parts worked really well and once you found the part it was easy to add to the build area. LDCad has a nice, 6- tabbed window on the side that allows you to setup 6 different part bins. This allows you to quickly jump between different part types or categories. It also has the ability to save parts to a Favorites list and has a history list as well (broken down by: the last 24 hours (two lists, one with parts and one with the parts and the colors you used for those parts), parts in the last 7 days, parts in the last 31 days and all parts). I found this the quickest and most useful approach to handling parts. Once you find the part you want you simply drag it to the build area and place it where you want. While dragging a part out to the build area you can use the arrow keys to orient it, in 90 degree increments, in the direction you desire. Pressing CTRL+<Arrow Key> allows you to rotate the part by 45 degree increments to correctly position it. Not sure I liked this CTRL+<Arrow Key> approach of having to keep the left-mouse button held down to be able to rotate the part when you drag it out but, given how parts are manipulated once on the build area (more on that later), it makes sense. I actually got these tips (for orienting parts while dragging them out) from the tutorials, it’s wasn’t readily apparent you could do that when dragging the part out. You can quickly go back to the part bin and select the same or a different part to drag out. Or, you can press Insert to create a copy of the current selection or working part. Summary: Finding parts worked very well, and once you found the part it was really easy to add it to the build area. Note: The latest 1.5 Beta 1 version allows you to have more than one parts bin (docked or floating window) and you can arrange them any way you like! You can go crazy when it comes to setting up part selection bins! LDD’s part bin breaks parts out by different categories and also allows you to search all of them. The categories didn’t always make sense to me, but after using it for a little while I started to get the hang of it. However, many times I would have to go online and search for a part number to find what I was actually looking for because there were so many parts to scroll through. One reason there were so many parts was because not only did it have the part, but it had every color of the part available (there’s actually a little filter button at the bottom of the part window that will let you filter by color, which I didn’t know existed originally). This added way more parts to the screen, whereas the other programs would only list the part once and allow you to choose the color. The search feature works fairly well if you are somewhat familiar with the part names. For example, I searched for “1 x 2” and it listed a lot of other stuff besides bricks. I searched for “1 x 2 brick”, and nothing showed up. I searched for “brick 1 x 2” and it did return the desired results. Once familiar with part names it would probably be easier to search. Search results were grouped under the different categories, which made it easier to find the part later if you didn’t want to use the search box. Having the pictures was nice, but once you got a couple categories expanded (sometimes just one) it was a scrolling nightmare to try to find something. There is no way to “Favorite” parts and I didn’t see any part history that could be referenced to re-use previously used parts. Summary: Finding parts was fairly easy and adding parts to the build area was really simple. 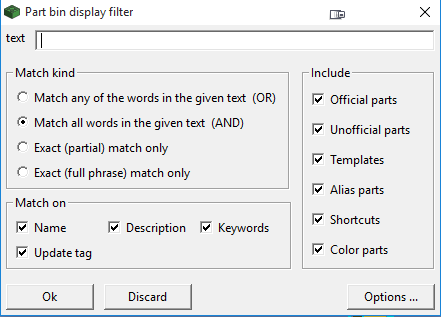 LeoCAD had what I would call the “traditional” part list window. Categories were displayed and you could drill down into them to find the part you wanted. No pictures were displayed until you selected a part, you just had text descriptions to use to try to find what you were looking for. I found that this took a lot longer to find parts because you had to read the individual descriptions. Pictures convey the data much faster. Searching for pats was easy though, and you could search by part number, description or name. Results would be filtered automatically as you typed, and search suggestions would be offered as well. However, search seemed to use the “Starts with” search logic and, whereas the other programs I used usually just used single spaces in the part names, LeoCAD would add extra spaces. This made it harder to find parts until I figured it out. For example, if I typed in “1 x 2 Brick” it didn’t find anything (nothing starts with 1 x 2). If I typed in “Brick”, results were displayed, including “Brick 1 x 2” as a suggested search term. If I kept typing “Brick 1” nothing would display because there are two spaces between Brick and 1 and two spaces between the x and the second number. This confused me at first. Once you find the part you can easily drag it out onto the build area. I mistakenly tried to drag the part image the first time, and that doesn’t work. You have to select the actual part name from the list and drag that out to get the part. Thought that was kind of odd. Once you drag a part out you can move it with the arrow keys, but orienting it has to be done after you place the part. I didn’t really care for this approach, it seemed to be a bit of a hassle to quickly orient new parts. I didn’t see any way to “Favorite” parts and I didn’t see any part history that could be referenced to re-use previously used parts. Summary: Finding parts was a little troublesome to start with, but once the part was found it wasn’t to difficult to add the part to the build area. 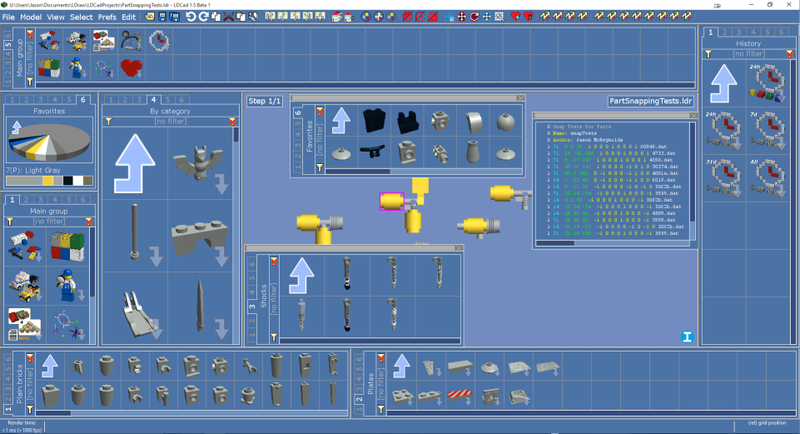 From what I found in my searches, MLCad has been somewhat of a standard for building LEGO models. 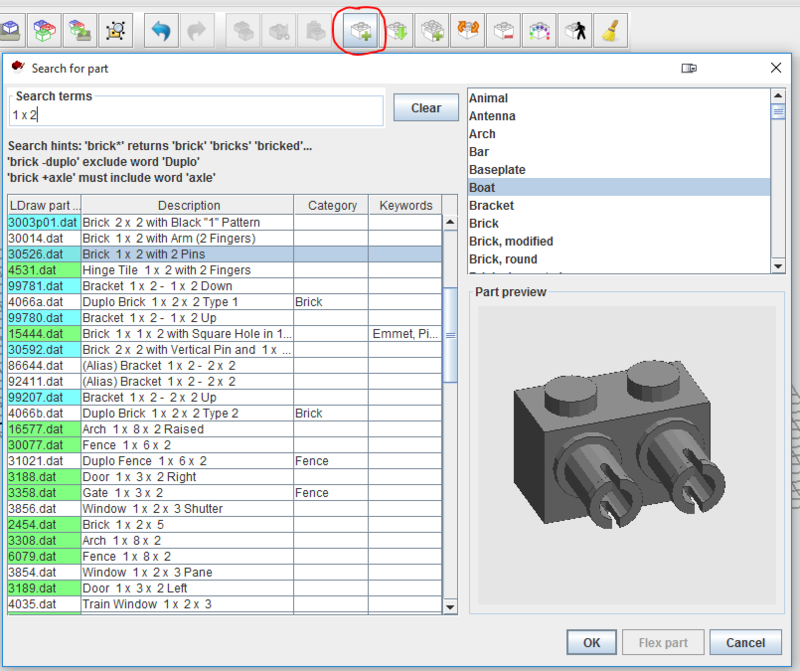 The part window is split in half, with categories displayed on the top and pictures of the parts for that category displayed on the bottom. You can scroll up/down in the picture window to view the parts in that category, or you can scroll left/right to change the category and view its associated parts. Searching was pretty easy once I found the search box. However, it appears that you can’t search on anything but a single term. If I tried to add a space and another term (i.e. “Brick 1”) it would say “The search string is invalid!”. Kind of annoying. I also had a hard time finding some parts that I had numbers for. For some of them I verified the part number online and found that there were alternate part numbers that worked. I think I had one or two that didn’t work at all. Don’t remember what the part numbers were, but thought that was a little strange. Once you find the part you are looking for, you can either grab the description or the picture and drag it out onto the build area. There doesn’t seem to be any way to quickly orient the part while, or after, dragging the part to the build area. If you right-click on the the part in the category list view you can add the part to your “Favorite” category for fast and easy reference later. I didn’t see any part history that could be referenced to re-use previously used parts. Summary: Finding parts was fairly easy as was adding them to the build area. 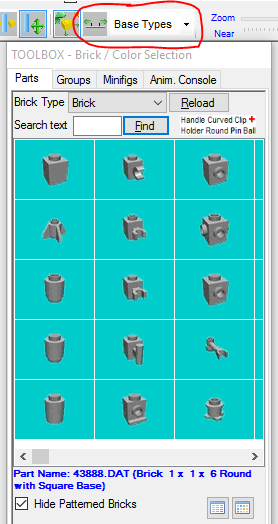 I had the same problem with MOC Builder as I did with LeoCAD: trying to find parts via a text description is much slower than browsing a bunch of pictures. You only see a picture of the part once you select it from the list. Search works fairly well and it is nice that it breaks the results down by category as well as an All bucket. However, search seemed to use “Starts with”, like LeoCAD and LDD, and if you search for “1 x 2 brick”, nothing shows up. If you search for “Brick 1 x 2” you get the desired results. Once you find the part you want you can drag either the description or the picture out to the build area. Once the brick is on the build area you can easily orient it using the arrow keys, much like LDD. I really liked being able to quickly orient parts this way. Summary: Finding parts worked, and it was pretty easy to add them to the build area once you found what you were searching for. SR 3D Builder’s part search uses drop down menus to filter by categories and then displays pictures of the parts in that category. This is similar to some of the other programs and makes it pretty easy to browse through categories to find what you are looking for. There is also a “Category” selector in the main toolbar, that seems to limit the “Brick Type” in the part window. Searching was harder for me to figure out, but it looked like it could be pretty powerful. Searching for part numbers and part names had mixed results and was frustrating more than anything. I finally gave up and consulted the manual. To search for part numbers you have to precede them with an asterisk “*”. Using a “-” before the word, the selected brick type is searched for. Once I did find the part I was looking for I thought I could just left-click on it and drag it out to the build area. That didn’t work. Double-clicking the part added it to the build area, but it didn’t seem to want to stay. I had to consult the manual again and found out that, after dragging the part to the build area, you have to press Space, Enter or right-click the yellow center of the “D-caddy” to add it to the model. There is no way to favorite parts or a recent part list that I could find. Summary: Frustrating to try to figure out how to search for parts and add them to the build area. Once I figured it out it wasn’t too difficult but was rather different than most of the other programs. All of the programs have a bit of a different take on managing parts, but after playing with all of them LDCad stands out to me. It is pretty simple to just drag parts out and place them. Having the ability to have 6 tabs, or 6 different part bins, along with the ability to favorite parts and a part history, really makes it easier to find and work with parts. Not to mention that the current beta release allows you to have as many part bins as you want (floating or docked windows)!